In an interview with The Springfield Republican, Rhodes recalled leading this concerto in New Mexico with violinist Mark Kaplan and cellist Clancy Newman, where he found “that they are of two different generations…made for an extremely rich musical pairing.” With the SSO, the same pair fully engaged in what the maestro calls “essentially a duet…that is very rare in Brahms.” Their close rapport heightened both the excitement and the poignancy of the many solo passages they exchanged, and Rhodes drew warm, vibrant support from the orchestra in all three movements. During remarks before the Bruckner symphony after intermission, Rhodes introduced four players of “Wagner tubas,” invented by that composer to combine the sounds of the French horn and trombone in his operatic “Ring cycle.” As Rhodes noted, they add “a unique sonority” to this symphony’s radiant second movement, an elegy to the dying Wagner, Bruckner’s musical idol. Evoking the frequent description of Bruckner’s symphonies as reflecting the mountains and valleys of his native Austria and the resonant church organs he played for most of his life, the SSO’s towering performance of this epic work was one of Rhodes’ finest achievements in his 16-year tenure. All four movements feature strong contrasts of tempo and dynamics, and Rhodes and his musicians made the most of them. Members of the brass section may have been the stars of the evening, but woodwinds, strings, and percussion were equally adept. That the capacity audience was riveted throughout this relatively unfamiliar 65-minute symphony and that the players have never looked more enthralled with their craft are tributes to Rhodes’ inspirational leadership. This is clearly a musical partnership built to last. Taking on any large-scale musical is daunting enough, let alone a tale that’s been an animated Disney film beloved for a quarter-century, but the St. Michael’s Players have turned out a true winner. This reviewer arrived with eight-year-old daughter in tow (to ensure that any glaring departures from the film would be duly noted) to find a packed house, still abuzz from the previous (opening) night’s performance. Clearly, the bar had been set high. And deservedly so. From the first moments, said daughter sat wholly entranced, as was the audience at large. 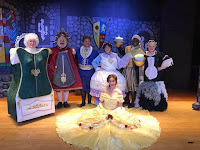 The big first number, “Belle,” introduced this winsome yet strong-minded lead character (played and sung wonderfully by Jasmine Rochelle Goodspeed) along with seemingly dozens of cheery townsfolk. Her inventor father’s steampunk-ish wood-chopping device was cleverly portrayed as half-bicycle half-machine, adroitly getting around the need to have a horse-drawn cart as in the film. Much of the comedy here comes from the preening, clueless village macho-man Gaston (AJ Berube) and his wisecracking sidekick LeFou (Brandon Garcia this night; the role was double-cast). The pair were simply outstanding. With his linebacker’s build and inexorable confidence, Berube shines as Belle’s relentless, musclebound suitor. Garcia, small and wiry, is young-Jerry-Lewis, bouncing back from every undeserved punch with the springy energy of a cartoon character. Once at Beast’s enchanted castle, we meet another terrific group of actors too numerous to mention individually. Silk Johnson is a pure delight as Lumiere the human candelabra, complete with flaming “hands” that “burn” brightly to illuminate his zest for life. Tim Moriarty’s sputtering half-clock Cogsworth is a perfect counterpoint. Sue Comstock McNary (Mrs. Potts) brings motherly compassion and sings the title song beautifully. David Leslie’s acting is a bit handicapped by the Beast mask, but his rich baritone voice is special and humanizes the character nicely. The costumes were simply outstanding; the sets well-realized and excellent choreography moved the huge cast of extras and kids about the space without traffic jams. Director Frank Jackson’s band was note-perfect as well. No wonder the place was sold out. This is exactly how big community theatre musicals should be done. Whenever a beloved classic is re-imagined — be it from book to screen, from stage to screen or, as in this case, from screen to stage — there are always skeptics who would discourage the attempt and purists who would protest. In the case of “An American in Paris,” one of the most beloved MGM movie musicals, starring the suave screen legend Gene Kelly, who danced his way to stardom through the 1940s and ’50s, it was a bold undertaking. It’s a simple story line. In post-World War II Paris, war veteran Jerry Mulligan (Garen Scribner) takes the stage as a giant Nazi banner floats to the floor and a French tricolor is raised. An aspiring artist, Jerry attempts to stake his claim to fame in the city. Within the first balletic intro, Jerry is instantly smitten by the elusive Lise Dassin (the petite Sara Esty), an aspiring prima ballerina. He also meets and befriends fellow war-veteran Adam Hochberg (Etai Benson), an aspiring concert pianist, and Henri Baurel (Nick Spangler), an aspiring song/dance artist. Did I say aspiring? Yes, in the wake of war’s desperation and darkness, hope is slowly reemerging. The three new friends, self-dubbed the “Three Musketeers,” have a lot in common, including, unbeknownst to each other, love for the same woman — “boy-meets-girl” times three. Did I say simple? Reemerging hope is depicted visually as bread lines, blackouts and drab tones give way to vivid color, light and vitality, best exemplified by numbers like the splashy “I’ll Build a Stairway to Paradise,” Henri’s Radio City fantasy sequence, and climaxing in the Mondrian-style vibrance of the concluding 14-minute piece-de-resistance that brings the production to dramatic heights and gives Scribner and Esty the spotlight in a breathtaking, flawless performance. For the second “Masterworks” program of its 73rd season, the HSO presented a full concert of music by Johannes Brahms, whom their web site calls “one of the most captivating masters of musical form” and quotes as saying, “It is not hard to compose, but what is fabulously hard is to leave the superfluous notes under the table.” No superfluous notes could be heard in this rewarding program. HSO Music Director Carolyn Kuan opened it not with one of Brahms’ two concert overtures but with two of his 21 Hungarian Dances. Arranged for orchestra from his original piano settings of traditional Gypsy melodies, these were the most popular of all Brahms’ works during his lifetime. 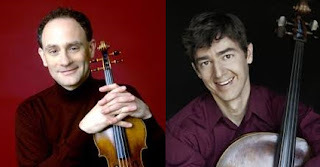 The HSO gave bracing accounts of the famous fifth and less familiar seventh dances. World-class violinist Cho-Liang Lin was featured next in one of the cornerstones of the classical repertoire, Brahms’ Violin Concerto. Like Kuan, a native of Taiwan, Lin never achieved the superstar status of the older Itzhak Perlman or the younger Joshua Bell, but it would be hard to imagine a better performance of this rapturous yet challenging masterpiece. A moderate tempo proved ideal for the long opening movement, where Lin’s burnished tone reflected both technical mastery and emotional depth. He played the ravishing slow movement with sensitivity and the lively Gypsy-flavored finale with flair, while conductor and orchestra were in full-bodied rapport throughout. A commanding rendition of Brahms’ fourth and final symphony brought the program to a somber close. The symphony opens with a quiet melancholy theme, but the first movement builds to a dramatic conclusion. The slow second movement is dark and funereal, while the third movement is a bright dance-like scherzo. The finale is a passacaglia, or variations on a short theme, that reaches a shattering climax. Kuan’s urgent leadership drew passionate commitment from her musicians and made it clear why the audience at the work’s Vienna premiere in 1897 was so moved when the composer made his final public appearance there less than a month before he passed away. A few years ago, I discovered a little theatre located on a side street in downtown Hartford. The venue is not typical; audience members enter through an art gallery, walk a long staircase, then to seats and stage surrounded by metal poles. This is TheaterWorks. Its current play, “Relativity,” is “little” at 85 minutes and three characters. 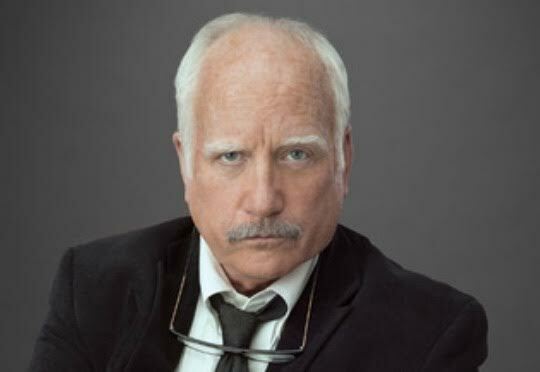 This is where to find a triumvirate of talent: renowned actor Richard Dreyfuss, creative director Rob Ruggiero, and flawless playwright Mark St. Germain. With a title like “Relativity,” it’s not surprising that Albert Einstein is its central character. To a large degree, the word “relativity” delves into Einstein’s family rather than science; in other words, his relatives. His wives, sons, daughter, grandchildren – who would have thought that geniuses like Einstein also have mundane lives? We watch a journalist’s interview with the famous man. The clue comes immediately when she questions Einstein about his first wife and his sons – this is no ordinary interviewer asking very personal questions. “Relativity,” one of St. Germain’s fictionalized biographies succeeds, as all his works do, as a dramedy. An unfolding mystery evolves. More important are conflicting questions of greatness for mankind vs goodness for one’s small world of family. Credit to the audience that did not applaud when Dreyfuss first appeared onstage. Oftentimes, famous actors are acknowledged simply because they are well-known. Dreyfuss, disheveled and sporting the iconic hairdo, immediately becomes Einstein. Dreyfuss portrays the scientist as steadfast and egotistical. Yet, we can see the wheels turning in his head, as Einstein questions if goodness and selfishness can possibly go hand in hand, even for him. Dreyfuss is as brilliant an actor as his character is a scientist. Christa Scott-Reed, the journalist, holds her own in the role of woman on an important mission. Verbal fisticuffs with Dreyfuss are an even match. Lori Wilner, the housekeeper, makes a formidable appearance in a role that helps define her friend/employer more than herself. Director Rob Ruggiero (who wears many creative hats at TheaterWorks) places every movement, moment, and word of dialog in unison. There is no waste. Masterful set designer Brian Prather provides a strewn-about private space with an always-closed door that the interviewer enters, somewhat at her own risk, and more at Einstein’s risk. Unfortunately, the run of “Relativity” is just about sold out, even with two weeks added. But call the box office, just in case; there might be a seat for you. Eight lively actresses grace the Majestic Stage in the current production of “Love, Loss, and What I Wore.” The steady appearance—on hangers, one at a time— of a lifetime’s wardrobe prompts memories, both poignant and amusing. As they take turns describing the events that surround the occasion when each particular dress was worn, they reveal fragments from the stories of their lives. Experiences shared by so many women – body awareness and shame, comical interactions with mothers, sales clerks, and the men in their pasts – prompt laughter and sympathy. However, this Nora Efron piece lacks a story arc, character development and conflict, plot, and other elements we rightly expect of live theatre. At best, it seems the writer could have used a one-person monologue as the vehicle for this memoir, in the style of Billy Crystal’s recent “700 Sundays.” We never really get to know any of these women (we see only one relationship among them), nor are we told why they have assembled and how they relate to each other. Where does their bond come from? What prompts these confessional-type revelations? Our emotions are buffeted about, from sadness to comedy and back again, and stereotypes keep emerging. Because their assigned roles vary as well -- each actress takes on different parts during the play—the audience is further distanced from the possibility of character growth and familiarity. They vow devotion to dressing in black, but this production’s lighting makes their black clothing go flat and dull. Both this absence of costume and the minimal set rob the audience of visual interest and make this production feel under-funded. In spite of these limitations, the matinee audience (largely female) supported the performance with frequent laughter and the almost universal recognition of women’s shared experiences. Ephron’s script – tying memoir to outfits – just needed a better concept. When I look at the word “farce” in a play’s title or as a key description of what I am about to see, I immediately count the number of doors onstage. As it turns out, the cover of Playhouse on Park’s program book for “Unnecessary Farce” had already printed the words in a large font – eight doors. Eight, hmm? This was sure to be fun. Playhouse is a small theatre, both outside and in, yet its stage is large, permitting enough room to hold just about any piece of theatre. The audience sits on three sides, evenly distributed, with the stage as the fourth wall. Sight-lines are perfect. Its actors are a mixture of Equity and community pros – it is impossible to know which actors have the credits and which do not. Besides, it doesn’t matter. Comedies, especially those with an emphasis on farce, are about as brainless as one might expect. Playhouse does perform some meaty works; i.e. a Eugene O’Neill play is scheduled for this winter. However, this lark is sheer fun. And, yes, every door is opened and shut (sometimes slammed) countless times. Our heroes, two rookie cops on their first stake-out, set up a sting to catch the mayor’s embezzlement scheme. With an invisible wall center-stage, are two abutting hotel rooms. There are lots of fast comings and goings which also include a couple of crooks and an “assistant crook”. Although “Farce” is an ensemble work, Susan Slotoroff (Police Officer Billie) takes the helm. Slotoroff plays newbie Billie with humorous bravado and effervescence. Will Hardyman (Officer Eric) embodies his nebbish role with fun. Julie Robles makes her Playhouse debut as a purposely over-the-top lovelorn accountant, Mike Boland gives his Agent Frank a no-nonsense ridiculous Jack Webb demeanor, and John-Patrick Driscoll depicts physical humor with aplomb. Director Russell Treyz creates “Farce” somewhat as a circus. Every member of his cast moves fast and is extremely agile. The two side-by-side beds quickly become the literal jumping off point when the play’s action sparks. Even the 6’+ Driscoll is nimble on his feet. 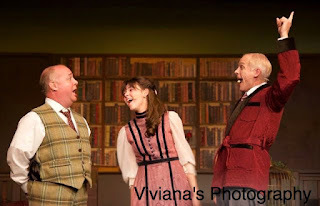 It must also be noted that Driscoll’s indecipherable Scottish brogue offers the play’s funniest moments. “Unnecessary Farce” might not be necessary to see. For those who want laughs, it comes close.